While in chiropractic school, Dr. Trevor participated in many different aspects of student life, including: Student council, Philosophy society, Toast Masters, and founded an annual 5K run. He was elected to the exclusive Vogt Leadership Society and honored with the Virgil V. Strange Philosophy Award, given to the one student in each graduating class that best represents the philosophy of chiropractic. Dr. Trevor is an Alumnus of Western Michigan University with a bachelors degree in medical anthropology and a minor in math. He ran track and cross country for WMU, focusing his talent in the Steeple Chase. 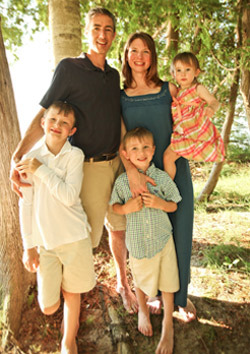 Dr. Trevor is an avid runner and competes in many local races and triathlons. Dr. Trevor and his wife Rachel have three children: Grant, Qwynn, and Genevieve. The family enjoys downhill skiing, walks in the woods, biking, swimming in Torch Lake, and building sandcastles in the summer and snowmen and snow forts in the winter. They love living in Northern Michigan in all of her glory, whatever the season.